Regular dry riser testing is essential to ensure the equipment is in good working order. Servicing and maintenance of the equipment should also carried out at this time. The importance of a working dry riser cannot be underestimated. The Fire brigade depends on dry risers in their fight against fire. If they cannot quickly and easily access the equipment or if it is faulty it may hamper their attempts to fight the fire so further endanger lives. The 2015 British Standards BS9990 lays out recommendations for dry riser testing, maintenance and servicing. It recommends a visual inspection of dry riser equipment every six months and a more detailed physical dry riser test each year. The visual inspection of dry risers, required every 6 months, is to ensure that there are no obvious signs of damage or vandalism. It is important to document this and to quickly repair or replace any damaged or missing parts. 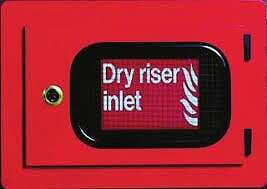 It is a legal requirement that all dry riser installations undergo and pass a more in-depth dry riser test every 12 months. This annual dry riser test involves a physical testing of the dry riser installation. This includes a hydraulic pressure test (or wet pressure test). Using a fire service approved hose and water pump the system is filled with water to a pressure of 12 bar (175psi) for a minimum of 15 minutes. This tests the system for any leaks. Our engineers carry out an initial air pressure test first to reduce the risk of a flooding should the dry riser leak. A comprehensive test of all valves, washers, seals, inlet and outlet valves is carried out along with a check of the dry riser cabinets and signage. Once the test is complete the dry riser system is drained and outlet valves are closed and secured with padlocks and straps. Finally the inlet breeching cabinet is closed and locked. Following a dry riser test or a dry riser service, a certificate is issued to record the date of the testing and confirm the equipment passed the test and that it meets the requirements of BS9990:2015. All our fire safety equipment and products are quality assured and the service and maintenance of fire extinguishers is undertaken to BS5306-3 2017. Certification which has been approved by the British Standards Institute and BAFE training requirements of SP101.